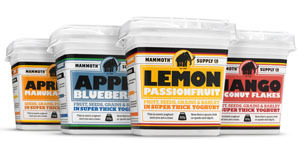 Mammoth really did ‘maketh the man’ when it launched it’s no-nonsense, fill you up brand into the Australian Market in 2010. Desserts aimed specifically at men, it has all the healthy appetite appeal but talks in a mans language and comes in man sized formats. The name, the paint pot style format and the ingredients, combine to make this a true innovation.